March Madness Check-in — The Sweet Sixteen! Woo-hoo! The Oregon Ducks’ bench celebrates after Payton Pritchard (3) hits the three-pointer. Did you make a bracket? Because it is that time of year, when March Madness has overtaken phones and laptops in classes. Have you been watching? It’s been an incredible basketball tournament so far, and there are still many games to be played. As of now, the first rounds of 64 and 32 tournament games have been played. Just 16 teams remain, also referred to as the “Sweet Sixteen.” The top-seeded Duke Blue Devils, led by Zion Williamson, barely snuck past UCF in the second round, but succeeded in making it to the Sweet Sixteen. Joining the Blue Devils, all 1, 2, and 3 seeds held off upsets in the first and second rounds of play, taking up 12 spots in the sweet sixteen. There were a lot of upsets in the first round, but top-seed teams seemed to take the crown in the second round. Upsets that shocked the nation were games such as 11-seed Ohio State taking down 6-seed Iowa State, 13-seed UC Irvine triumphing over 4-seed Kansas State, and 10-seed Minnesota outlasting 7-seed Louisville. Interestingly, three 12-seeded teams took down 5-seeded teams in the first round. 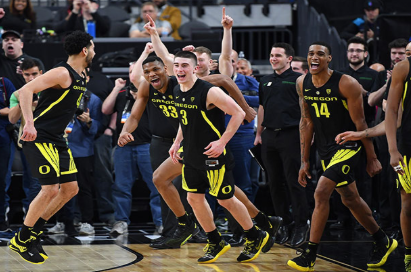 Speaking of 12-seeds, the Oregon Ducks beat 5-seed Wisconsin and survived 13-seed UC Irvine’s late run in the second round to make their Cinderella story in the sweet sixteen. The tournament continues March 28th with Gonzaga facing off against Florida State being the first game. Games will be played all weekend long beginning tomorrow night, going through the Sweet Sixteen round and the Elite Eight round. Only one perfect bracket remained in the world as of publication time… but here’s hoping yours is still in tact!